Congratulations on making it to my third watercolor tutorial! I've been hearing from many of you via Instagram, Facebook, and in the comments section about what a stress reliever painting is and how these tutorials are helping you be more creative. It makes me so happy to hear that! Thank you for all the love and feel free to leave feedback on today's tutorial by clicking through to the comments section at the top of this post. 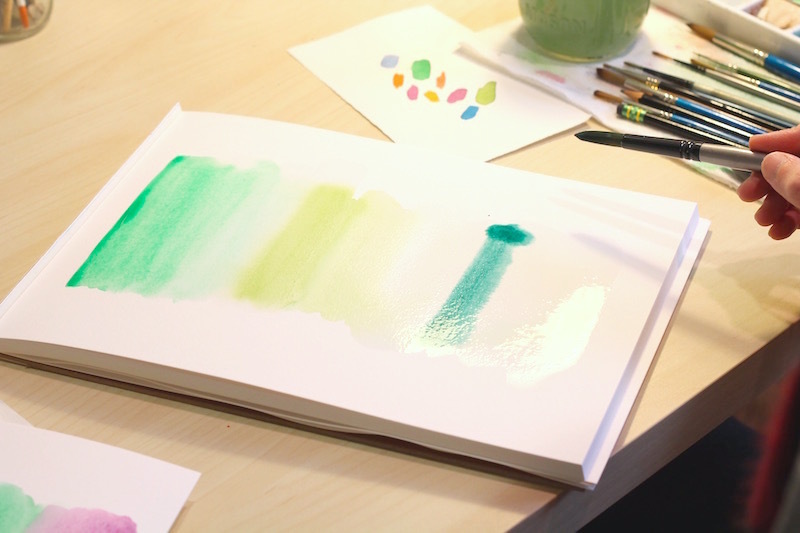 You'll notice that watercolor is a transparent medium (as in, you can see right through each layer to the color underneath) and tends toward a more gradient and varied look as opposed to a flat look like acrylic or gouache. You might find this lesson a bit easier than the last as we'll be letting the paint run and bleed and do it's thing. The goal is to NOT overdo it with your brush strokes, but let the water do the work for you! 1. Start with a clean wet brush, size 16 (or the biggest one you have similar to mine). Move the brush side to side and drag the water (no paint yet) down the paper until you almost reach the bottom. Be generous with your water here. Can you tell from the pictures about how much water I'm using? Look at your paper at an angle to see how much water is on the page. You should see a thin even layer from top to bottom. 2. Now, let's add the first color. I chose various greens, but you can work with whatever colors you want. Blues would also be pretty! Load your brush with the first color and drag it across the very top of your paper where the water begins. See how the water pulls the paint right off your brush? Move the brush back and forth, gently, until you've covered about a third of the page. 3. Repeat step 2 with the second and third colors. You'll want to make sure you're working wet into wet, meaning a wet brush working the paint onto a wet surface. So, try to work quickly so your paper doesn't dry while you're working. Also, you'll need to exercise restraint in not over-working the painting. To lay in each color I used about 5-6 brush strokes. Once all three colors were on the paper, I added a bit more water to the darker green area to make the bleed- one brush stroke. If you over-work an area with this wet to wet technique, you'll notice the paper start to deteriorate and the colors will muddy. Let them bleed together and blend on their own. 4. Let the painting dry completely. It really will change as it dries. See all the little areas where the water slowly moved the pigment as it dried? Those are called bleeds, and they're so fun to make! No other painting medium can create that look, which is why I love watercolor so much. As usual I encourage you to have fun with this exercise and try it several times in multiple colors. Three of these gradient washes would look really pretty framed in white frames and hung together in a room. Share your results with me! Send me an email at Michelle@TheArtofMichelle.com or tag me at #theartofmichelleteaches on Instagram and Facebook.